I am Zhaawano Giizhik. 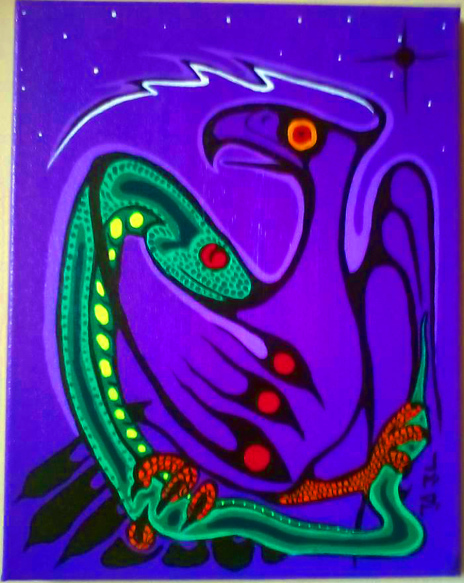 This blog story is the eleventh in a series titled Teachings Of The Eagle Feather, featuring my works of art along with those of kindred artists. Both my stories and my artworks seek to provide an insight into the unique world view of the Anishinaabe Peoples. Today's story features a brand new set of wedding rings by myself, canvases by second-generation Anishinaabe painters Simone McLeod, Bebaninojmat (Leland Bell), and Moses Amik, a graphic work by an unknown Woodland artist, works by the late, first-generation, Medicine Painters Miskwaabik Animikii (Norval Morrisseau) and Carl Ray, and, last but not least, a beautiful tile mural done by students of a High School in Alberta. The English word cosmos means "the universe seen as a well-ordered whole." Aki is an Ojibwe Anishinaabe word and it means land, earth, world, and cosmos/Universe. Waawiyekamig is another Ojibwe Anishinaabe word for Universe/cosmos, its literal meaning is “Round world.” When we break down the word we get: /waawiye-/ round; /-akamig-/ land, world, ground, event. In the old days, the Peoples of Anishinaabewaki (Land of the Ojibwe Nation), in particular the men and women belonging to the Midewiwin (Way Of The Heartbeat Lodge), listened to waawiyekamig (the cosmos), to aki (the world, the earth), and to the manidoog (spirits) and awesiinyag (the animals) that live in the world. They sought the images and voices of the spirits and the animals in an extensive set of ritual stories and songs and in dreams and visions and depicted them on rocks and on medicine bags, in birch bark scrolls, and on a myriad of other items and utensils. In return the world and all the animals and the aadizookaanag (guardian spirit beings) that dwell there disclosed to these individuals - and to their communities as a whole - essential norms and principles for bimaadiziwin: how to live long and wholesome lives. 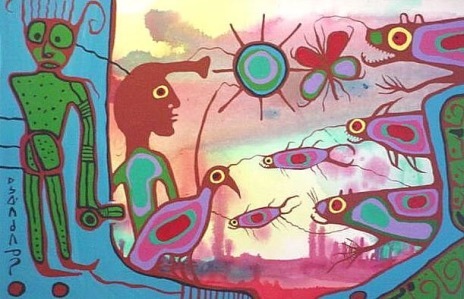 Image: Pictorial Legend Painting by the late Miskwaabik Animikii (Norval Morrisseau) depicting several realms of cosmos, with a continuous interaction and a reciprocal exchance between several life forms, corporeal as well as incorporeal. Alternately pronounced as muh-DAY-w'win and mi-DAY-win, its literal meaning being “Society of Those Who Are In A Mide State” (Mide meaning something like “Sacred And Unseen”), the Midewiwin is a thousands of years old lodge or association of male and female healers and thinkers and artists, respected keepers and protectors of the traditional Anishinaabe way of life and ceremonies. Midewiwin persons are generally called Mide, plural Mideg; participants of the ceremonies are referred to as Midew, plural Midewiig. Mideg themselves sometimes give the following, traditionalistic, explanation about the meaning of Midewiwin: “Society of the Good-hearted Ones” or “The Good Heart Sound Of Life”, or “The Way Of The Heartbeat.” The objective of Midewiwin is basically two-fold: one is to promote mino-bimaadiziwin (a long and healthy life for individuals as well as for the community); the other is to receive from the Spirit World the power - in the form of Sacred Medicine - to achieve that goal. Midewiwin's medicine and healing offer not only cures for diseases but also provide for precautionary measures to ensure bimaadiziwin. The Mide practitioners are initiated and ranked by degrees: four (Earth level) to eight (Sky level) in total. Image: "Oath For Peace (Around the tree Of Life)", acrylic on canvas by Leland Bell (Bebaninojmat), 1983. Healers and scholars of the Midewiwin gather around Midewaatig, the sacred Tree of Life, and communicate with the beings and the powers of the Universe. Midewiwin medicine and healing offer not only cures for diseases but also preventive actions to ensure mino-bimaadiziwin, a long, peaceful, wholesome life for individuals of the Nation as well as for the community at large. Midewiwin – some claim the word partially derives from the Anishinaabe word MINODE’ which means Good Heart, others suggest it derives from MADWEWE which means Sound Resonance, as in the echoing of the Mide water drum whose omnipresent sound represents the Earth’s heartbeat and that of the Great Mystery of Life – is said to have been founded many strings of life ago by the first herbalist/medicine man of his People, who went by the legendary name of Ode’imin (Heart-shaped Berry or strawberry). Under the skilful tutelage of his supernatural teacher Wiinabozho, who taught him to study the nature of plants from the conduct of animals, Ode'imin forever institutionalized the knowledge of curing and Mino-bimaadiziwin, or the Code for Long Life and Upright Living. He taught the People the properties and the curative powers of all beings of the plant world and conferred to them the philosophy of Mino-bimaadiziwin, which would forever be propagated through the ceremonies of the Midewiwin. 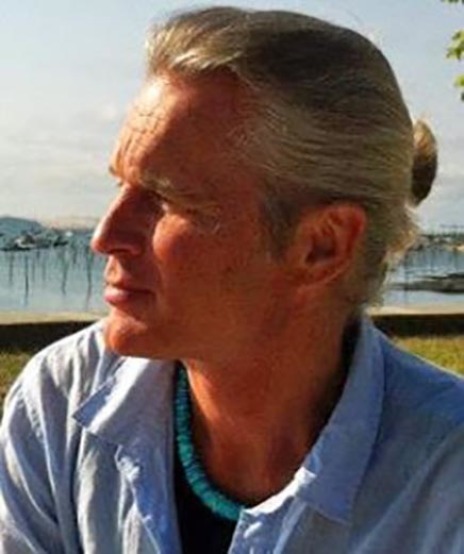 Ode’imin explained to the ancestors that the physical side of life and the physical strength of a human being and that of his community should alwas be in perfect balance with the spiritual side of life and being, and that a healer could only reach the highest possible order of healing powers through a high ethical standard, and not by knowledge alone. So, what counted for an herbalist was not only knowledge of plant and self, but also the ability to bring together the healing capacities of both plant and self. Only an herbalist gifted with and keeping up a high standard of inner power could expect the plant being to reveal his own healing power; only then the plant would allow the herbalist to confer his (or her) inner curative power upon the plant itself. “Communication”. 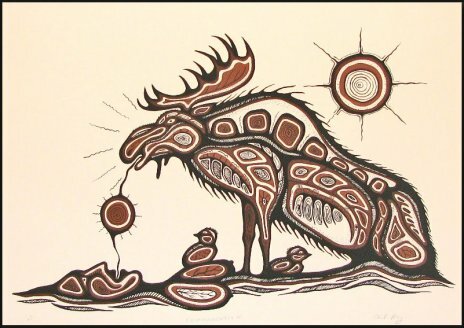 This acrylic painting by the late Anishinini (Oji-Cree) Medicine Painter Carl Ray depicts Anishinaabe izhinamowin (Native worldview), stressing the communication, reciprocal responsibilities, and mutual obligations that exist between all life-giving and life-sustaining forces and beings of Aki, the universe. Thus, taken in the widest sense, Aki not only means “earth” or “country” but also “cosmos” – a diversified and complex social circle of overpoweringly immense and timeless proportions, completely devoid of emptiness and (linear) time, and permeated with, and unified through, certain values and properties such as kinship, mutuality, and reciprocity. In conclusion, the earth herself, a star, a sand dune, a river, a rain cloud, the winds, a human being, a fish, and so on – all these myriads of “next of kin persons” composing the sacred web of life can be traced back to one cosmic source. Some call it JIIBAMAAMAA, or Source of Powers; most call it GICHI-MANIDOO, or Great Mystery – The Sum of All Spirit. Yest, as it is envisioned as the prime mover of creation, it is never attributed human form like (oftentimes) the Christian God. GICHI-MANIDOO is believed to have divided itself after which it enspirited all things in the universe with an ojichaag (consciousness) that is essentially the same as the ojichaag of human beings. Giizis, the sun who supersedes all beings of the natural world, became the ultimate symbol of fatherhood and of the spiritual relationship between GICHI-MANIDOO and the Anishinaabeg. Other Ojibwe names for the concept GICHI-MANIDOO are GIZHEWE-MANIDOO (“Great, Kind Mystery”), WENIZHISHID-MANIDOO ("Fair Mystery"), and GICHI-OJICHAAK ("Great Spirit"). While GICHI-MANIDOO means “Sum of Mystery” as well as “Great Spirit”, the literal meaning of GICHI-OJICHAAK is "Great Spirit"; GICHI-MANIDOO carries the idea of the greater spiritual connectivity while GICHI-OJICHAAK carries the idea of an individual soul's connection to the GICHI-MANIDOO. Tile mural at Ermineskin Junior Senior High School (Ermineskin Reserve in Maskwacis, Alberta) done by students, influenced by the work of Simone McLeod. Always the Anishinaabeg are mindful of the presence of this source called GICHI-MANIDOO; they will never fail to offer asemaa (tobacco) in places where the presence of manidoo is the greatest – in a grotto on the edge of a lake, on a small island, in a glade hidden in the forest, in a current, or at the top of a mountain. “Many moons ago, when the World was not yet born, GICHI-MANIDOO beheld a vision. It saw in its dream a vast sky filled with many stars and the day-sun and the night-sun, and it saw the earth in the form of a giant sea turtle. In order to make its dream come true GICHI-MANIDOO first decided to make rock, water, fire, and wind. These substances were born spontaneously, seemingly out of nothing, and GICHI-MANIDOO breathed into each one its sacred life breath. From these four sacred substances, each gifted with a different soul and spirit and nature and shadow, GICHI-MANIDOO created the world it had seen in its vision, filled with the sun, the stars, the night-sun, and the earth. To the day-sun GICHI-MANIDOO gave the powers of light and heat and rays to warm the earth. To the night-sun GICHI-MANIDOO gave the powers of light and the power to watch over the earth and all her children at night. To the earth GICHI-MANIDOO gave the power of growth and healing, and on and beneath her surface it formed hills, mountains, plains, valleys, lakes, rivers, streams, bays, wells, ponds, and even underwater streams. To these waters he gave the twin powers of purity and renewal. To the wind GICHI-MANIDOO gave music-making qualities and it infused in it its own power of breath of life. Waawiyekamig, the cosmos as the Anishinaabe ancestors perceived it, is made up of three spheres of layers. The first layer is Anaamakamig, the underworld. The underworld of the rivers, lakes, and seas house a myriad of manidoog (spirits) and aadizookaanag (spirit grandfathers and shape shifters). 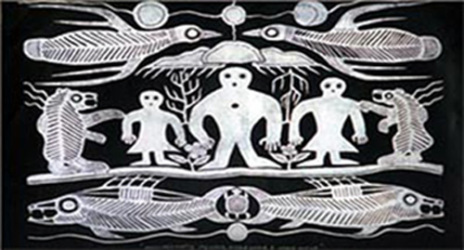 Both categories, manidoo and aadizookaan, are represented by fish and the fish spirits (gigoonhyag), including Makadeshigan, the black bass - who is also known as the Spirit of the Underworld -, Nibiinaabekwe/Nibiinaabe, the Mermaid/merman, and Mishi-ginebig, the Great orned Underwater Serpent. The silent, tranquil spirit of giigoonh the fish is from of old a totemic symbol of learning and transmission of science and medicine. The depiction of Mishiikenh, the mud turtle, refers to turtle as a grandfather and spirit messenger, an important intermediary between the lakes and rivers and their underworlds. Although physically the slowest of all creatures, Turtle symbolizes swiftness of the mind and is regarded as a master of communication of thought. The jaasakiidjig, the Mide-specialists often referred to as Shaking Tent Seers who are said to draw their spiritual healing power from the Thunder Beings, elected the turtle as their patron. 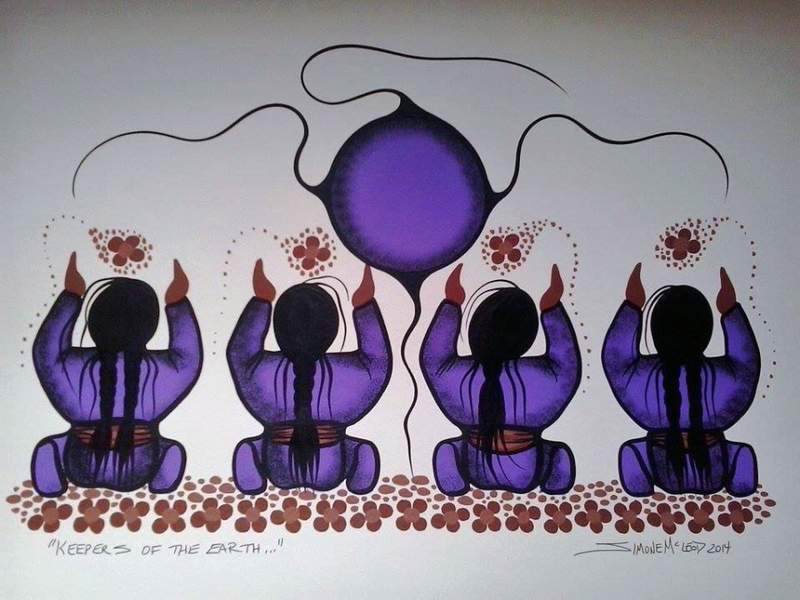 The second layer of cosmos is Agidakamig, the middle world, the earth’s surface called MIKINAAKOMINIS (Turtle Island) that houses countless corporeal and incorporeal beings; represented in the image by Anishinaabeg (humans), manidoog (spirits), mitigoog (trees), waabigwaniin (flowers), and makwag (bears). Makwa Manidoo, the Bear Spirit who guards the third door of the Midewiwin lodge, is a wise teacher and an aadizookaan (spirit grandfather) who opens doors to the spirits that live in the middle world. It is with the aid of the Bear Dance Ceremony that the jaasakiidjig sometimes pass on their spiritual medicine power to their patients or apprentices. The third layer of cosmos is Giizhigoong, the Sky World and all of its beings, corporeal as well as incorporeal. These beings are symbolized in the image by GICHI-MANIDOO (the Great Mystery) , giizis the sun and dibik-giizis the moon, rain and thunderclouds (representing the physical orders of the universe), as well as by bineshiwag (taloned birds of prey). The first of the bird species that comes into mind is Migizi (the bald eagle), who, with his sharp vision and ability to soar high in the sky world, represents all big predatory birds, and he is known as an intermediary between the humans of the middle world and the manidoog of the sky regions. 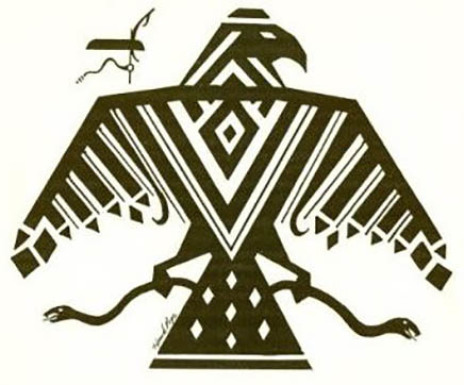 Gekek the Hawk, who is often regarded as the natural counterpart of the supernatural Animikii Binesi (Thunderbird), also plays an important metaphoric role in the world of the Bird Nation. Finally, the image suggests a natural linkage between the birds of the sky world and plants of the middle world, as well as a spiritual connectedness of the birds with the physical orders of the cosmos like sun, moon, earth, stars, thunders, lightning, rain, wind, fires, et cetera. This special union with all of nature enables birds to sense the changes of the world, the changing of seasons, and the future events or conditions of things. Besides Aki, or Agidakameg, the earth’s surface, the ancestor knew there were many other realms of cosmos, of which the four quarters of the world, the air above the earth, the sky dome, and the underworld were regarded the most important. These and many other realms were unified in the changeless and timeless universe surrounding the Anishinaabeg from time immemorial. The Anishinaabeg of olden times understood there is a constant split or war (conflict) between beings that dwell in the underworlds of earth and waters, and those that inhabit the earth’s surface, the waters, and the regions of the sky. Both categories of supernatural beings – of underworld and upper world – were, and are, generally referred to as aadizoogaanag (“our grandfathers”, or “makers of stories”: persons of the other-than-human-category). Like aadizoogaanag, the myriads of manidoog (spirits) as perceived by the Anishinaabeg are natural forces, and manifestations of the “other” world. They too may resume human, animal, or plant-like characteristics (or of any given matter) without being conceived as such. It is in dreams and spirit flight (trance) that the human individual, that is, his ojichaag (spirit/soul, the essential self), comes in direct communication with the ojichaagomaag of these supernatural personalities. Some manidoog on or beneath the earth’s surface are remote and, in the capacity of aadizoogaanag, related to creation; others occasionally appear in natural guise with distinct human or animal personalities; Wiinabozho, Wiisakejaak, the animikii-binesiwag (thunderbirds), and the horned misi-ginebigoog (giant underworld-snakes) belong to this class. Niimi'idiwag ("Northern Light Dancers") by Simone McLeod. Click the image for details. The artists presents the Grandfathers, the spirits of those who passed away and who dance in the sky and cause the fire of the Northern Ligths to blaze, as children. Simone is a modern storyteller at heart who uses canvas, paintbrush, and paint to convey the old stories. In traditional Anishinaabe life, the aadizogaanag and manidoog are presented in seasonally restricted, rather ritualized sacred stories. These parables and allegories depict the vital roles of “our grandfathers” in interaction with other beings (persons) as integral forces in the functioning of a unified cosmos – which the Anishinaabeg basically regard as one gigantic web of social relations, where the relationship between humans and the nonhuman and spirit world is one of continuous interfusion and reciprocal exchange. Thunderbirds, which come in different sizes, are considered the most powerful of all cosmic spirits, or grandfathers. They migrate with the birds that appear in spring and disappear in the fall. They are in charge of the Second Degree of the Midewiwin Lodge, as well as the Shaking Tent ceremony of the Midewiwin. They are extremely powerful, their Medicine aimed at nurturing and cleansening aki by their thunder and fertile rain as well as at assisting the people by driving away the ominous earth and water manidoog. Thunderbirds and the misi-ginebigoog or Sea Serpents of the lake are seen as their inveterate adversaries. In fact, Thunderbirds feed upon the great horned Sea Serpent of the lakes. Visually, connecting lines from Thunderbird feathers sometimes run from the wings, illustrating the knowledge and power given from above, to those below. Thus Thunderbird symbolizes the connection between sky and earth. "The Great Love that lives within ourselves"
A mixture of modern elegance and harmonic simplicity, these white gold eagle feather rings created in my studio in Amsterdam, the Netherlands. 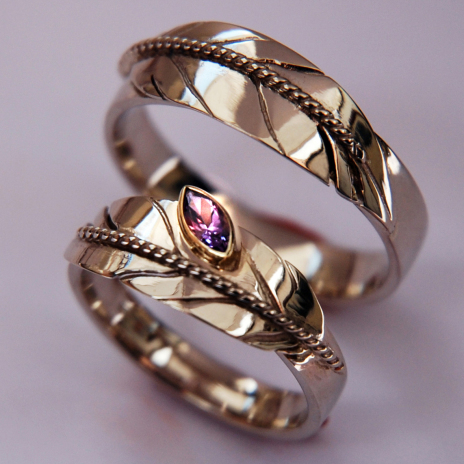 The title of the wedding rings is Nigaganoonaamin Manidoo, which literally means “We communicate with the Spirit/Mystery.” Color, shape, and asymmetric placement of the sparkling amethyst cradled in a 14K yellow gold bezel in the ladies’ ring create a touch of refinement and magic wonder that is typical of ZhaawanArt wedding ring design. Amethyst is said to be a meditative and calming stone that provides calm, balance, and patience, and to instill in a person bizaanide'ewin: peace in mind, heart, and soul. The stylized feather of the wedding rings represent the spirit of the eagle, and therefore communication with all of the cosmos. Feathers of Migizi and Giniw, respectively the bald eagle and the golden eagle, are believed to convey human thoughts and feelings and provide persons with an opportuni­ty to speak directly to the spirits with debwewin (a straight mind) and bekide'ewin (a pure heart). According to tradition, it were the animikii-binesiwag, the thunderbirds, the most powerful birds in creation and metaphorical representations of migiziwag (eagles) and gekekwag (hawks), who imparted to eagle feathers a fragment of their celestial power; it is even said that they gave each eagle four of their feathers. In addition to the eagle/Thunderbird feather symbol, the marquise-cut shape of the of the 0.236 x 0.118 inch stone that I placed off-center on one side of the feather represents ashkibag (a spring leaf) sprouting spontaneously from a stem of a plant or tree. It is a playful reference to the spring season, time of rebirth and new growth. The mysterious purple glow of the precious stone that seems to radiate from the core of the tree or plant leaf suggests a certain receptivity for GICH-MANIDOO, the omnipresence of the sacred energy and life force permeating the universe. Giiwenh. So the story goes. Miigwech gibizindaw noongom mii dash gidaadizookoon. Thank you for listening to me today. Giga-waabamin wayiiba, I hope to see you again soon. Many of these sacred pictographs or petroforms – some of which are many, many generations old - hide in sacred locations where the manidoog (spirits) reside, particularly in those mystic places near the lake's coastlines where the sky, the earth, the water, the underground and the underwater meet. As Zhaawano understands it, it is in these sacred places invisible to the ordinary, waking eye that his design and storyteller's inspiration originate from.